Morning arrived, and apart from feeling somewhat muzzy, I was fairly unscathed by my overindulgence. We did not make an early start, and had done less than ten km before stopping to buy bottled water, biscuits and Mars bars. Looking at Chris’s back tyre, it was obvious that it needed to be replaced – the kink had worsened, and it was bulging threateningly. The tyre swap didn’t take long, and unable to just throw the old tyre away (they were a present from his daughter Hannah), Chris strapped it to his rear carrier. (Chris has subsequently mounted the bulge portion of the tyre on a small plaque in his loo!) It was quite hot, and we saw a number of other pilgrims on foot. One chap, who was quite elderly, was carrying a massive lopsided rucksack, and making painfully slow progress. We rode on, stopping by a roadside water fountain to top up our bottles. I had a couple of 500ml bottles, and this was the day I realized that even though they had a nice Bob Jackson Cycles logo, they were just too small! Chris lent me a fold up bottle, which took another litre. We reached the town of Villafranca del Bierzo, had our credencials stamped in the tourist office, and bought bananas and oranges. Then we visited the church of Santiago (up a short steep hill). Here, pilgrims who were too ill to complete their journey could be granted the same benefits as those who reached Santiago. Chris outside an interesting church on the outskirts of Villafranca del Bierza - note that it looks hot, because it was!!! 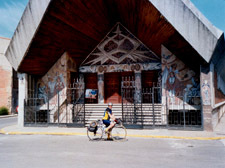 This isn't the church of Santiago -that's much older, in the centre of town. We were now back on a main road, the NV1, and it varied from pleasant to otherwise, according to whether the new motorway, often on spectacular stilts, had been built. 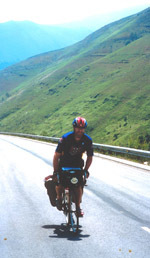 Fifteen kilometres from Villafranca, we turned back onto the old road and started to climb. Somewhere on this road, Chris gave me some salt, which I ate to counteract the effects of the heat, a tip he’d found useful cycling in Malasia, and in the Andes. Chris warned me that this was a long long hill; he was right! It was proper climbing – the terrain changed from fields and woods, to mountains with just grass for covering. As we passed a farm on the lower slopes, there was a moment of high drama – a lorry thundered by, avoiding a farmer on one side and a cow on the other, but a puppy (aahhh) dashed across – and made it! See photo below. The road continued onwards and very distinctly upwards – we overtook a number of walking cyclists, including a German husband and wife, who looked to be in their sixties – she was about half a mile behind him. We passed the three Dutch cyclists (two women and one man) who we’d met the day before. Still hot, still climbing! Look how tiny the shadow is. Definitely my toughest day! When we got to Pedrafita (1109 metres), we had a quick stop for a drink and snack, and as the weather was looking a little doubtful, put on our cycling jackets. 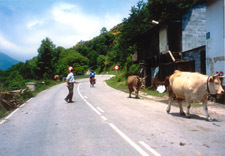 The main road dropped down to Galicia, but we turned left to continue our climb to O Cebreiro. It looked like 3 or 4 km on the map, but it felt like 20! At one point, Chris was a dot in the distance, I’d used all my water, and with my jacket on, was getting very hot. My speed dropped to 6 kph, and I just wanted to give up! The moment passed, Chris waited for me with water and Mars bar, and we pedalled on. We finally reached O Cebreiro, and made our way to the refugio. It was crowded, and we put our bags on a pair of bunks, in a tiny dormitory with four double bunks squeezed in, then joined the queue to book in. We may have done that the other way round…. but it was all fairly anarchic, so bagging bunks first would have been quite sensible! This was where I first encountered the pilgrim hierarchy for myself – walkers are at the top, and cyclists are underneath! So we were told that if there were still bunks unfilled by walkers at 8 pm, we could have them, if not, we were welcome to the common room floor…. Possession being 9/10ths of the law, we hoped to retain our bunks!